We had the opportunity to see the 21st Century Toys’ 1/18 scale Extreme Detail series P-47D Razorback Thunderbolts in a nice preview at the Hobby Visions 2003 show in Las Vegas. Since that time, 21st Century Toys was kind enough to send us a review sample, partly out of curiosity to see what would happen if someone were to refinish the model in an article. 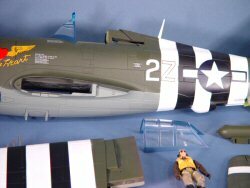 The Thunderbolt comes in the usual well-packaged (and large) box that protects the detailed subject very well in transit. Unlike their previous releases in this series, the Thunderbolt’s box is glued shut, so you’ll immediately know if anyone has been inside the box before you. My example had a minor glitch that must have happened during packaging, but this turned out easy to correct – more on this later. 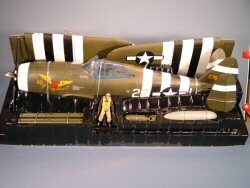 Straight out of the box, this P-47D ‘Peg O’ My Heart’ (2Z-L) was assigned to 510 Fighter Sqn/405 Fighter Group/9 AF. One of the unique signatures of this fighter group was to paint the squadron’s colors on the canopy frame: red for the 509th, blue for the 510th and yellow for the 511th. 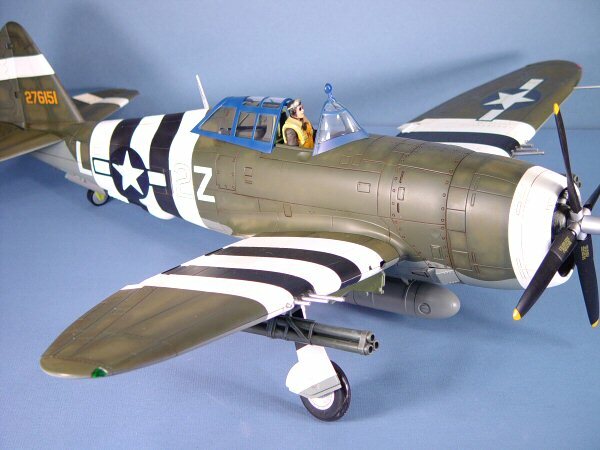 This aircraft still sports its D-Day invasion markings top and bottom, so the time period is still within a few days of the invasion. 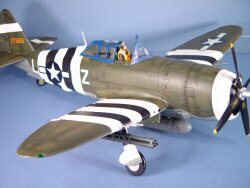 Using those facts, it is safe to say that the only fresh paint on the aircraft is in the form of those invasion stripes. 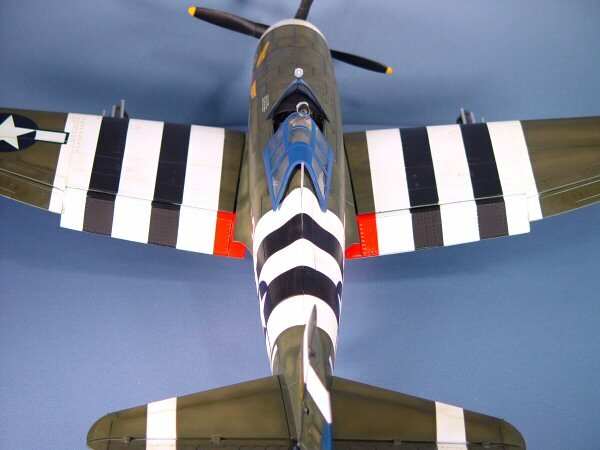 Many aircraft received some fresh paint as the upper invasion stripes were covered over after the invasion was well underway, but that detail isn’t depicted here. Therefore the actual aircraft probably didn’t look as clean and fresh as this bird does out of the box. The job is defined – weather the Thunderbolt! The first step was to repaint the canopy frames as the paint was transparent in places and detracted from the ‘model.’ I masked the canopy transparencies with Tamiya tape and sprayed the frames with Tamiya acrylic Blue. Next I touched up some of the painted-on details in the cockpit as some of the painting looked a little rushed. 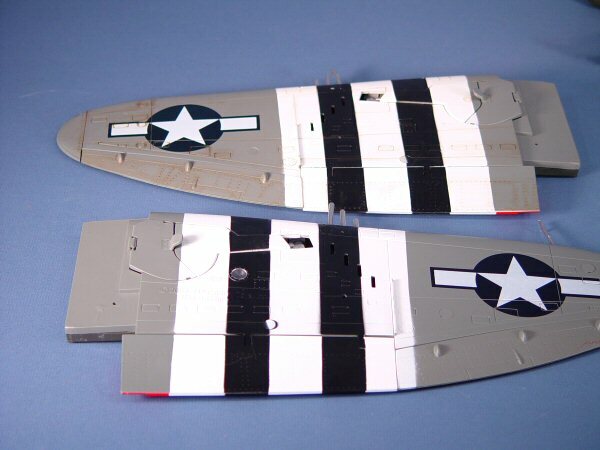 The coaming over the instrument panel was painted Tamiya Flat Black and the one missing detail here is the lack of a gunsight. If I miss that detail enough, I might get around to scratch-building one. With the cockpit completed, I turned my attention to that immaculate olive drab paint. As many of you know, OD Green weathers rather quickly and depending on the paint manufacturer, will fade into some interesting shades. I decided to stay conservative here and took Tamiya’s Olive Drab straight from the bottle and started painting inside of the panel lines. I added a touch of Tamiya Flat White to the color and repeated the step, painting more toward the center of each panel. Once again I added a little more white and repeated the process. The result was a ghastly patchwork of blended colors, but we’re not finished yet. I took an old t-shirt and buffed the paint smooth, this resulted in a nice subtle bit of wear and fading in the Olive Drab. The next step was to mix up some Van Dyke Brown oil paint into a diluted solution with Odorless Mineral Spirits and brush the mixture into the scribed detailing. 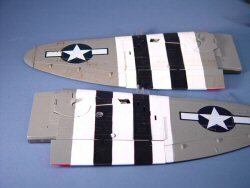 Don’t worry about spots and marks in the wrong places or putting too much weathering on any given spot. 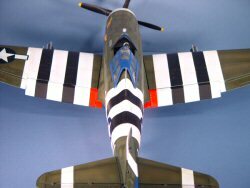 Just paint a surface at a time, like all of the upper surfaces on the wings, horizontal stabs and fuselage, and then set them aside for an hour or so. All you have to do is buff the excess off the surfaces with that same t-shirt. You can see in the photo to the left that the upper wing has received the wash while the lower wing is still 'clean'. If there are any stubborn spots, a bit of mineral spirits on the t-shirt or a Q-Tip will solve the problem. 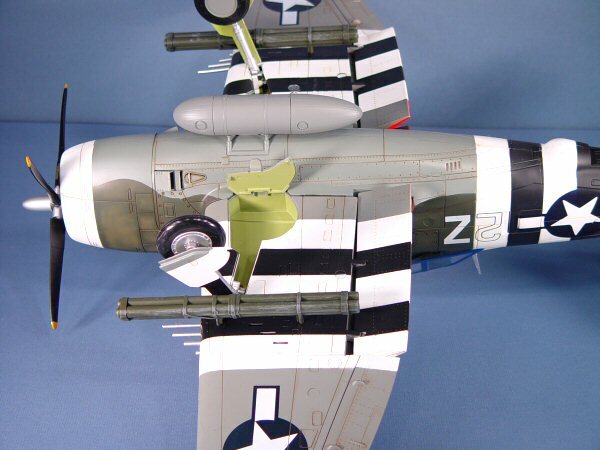 Whatever paint that 21st Century Toys is using with these aircraft, it doesn’t react to mineral spirits nor ammonia (Windex – for cleaning up any leftovers from the Tamiya acrylics). Once all of the parts are weathered, dry and cleaned up, it is time to assemble the Thunderbolt. Yes, assembly time was all of two minutes, though it almost took longer to figure out that the smaller main gear doors have to be firmly (but carefully) pried open to get the main gear down. Among the features of this release, the canopy opens and closes (though you’ll be amazed at the engineering behind this little feature), the main gear and tail wheel are positionable, as are the flaps and flight control surfaces. Once I get my aircraft posed, I usually don’t ‘play’ with them as they look too nice on the shelf or hanging in my workshop. 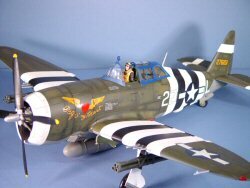 You can see that the combination of paint fading and weathering has added a little age to the aircraft while not significantly altering its overall appearance. If you want to be more creative, a silver pencil to show scratched and scuffed paint, another oil mixture to represent the oil that flows through (and out of) this engine, etc. You can have fun and add some personality to your flightline. You might have noticed the bent gun barrel in some of the early photos. This defied any attemt at bending back into shape. I decided to heat the barrel with a hair drier, and it had no sooner warmed up when it straightened itself! Cool! 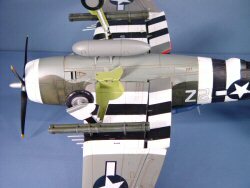 Another finishing touch was to paint the right navigation light with Tamiya Transparent Green. For some reason, the left wing nav light was already red, but the right nav light was clear. I added a dab of silver on the rear view mirror atop the windscreen. Aside from dry-brushing some gray onto the bazooka rocket launchers to bring out some of that detail, the job is finished! 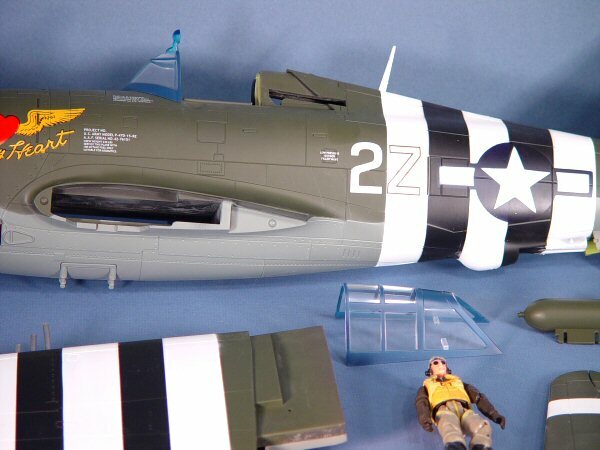 The next time you’re in a model building slump or you just want something fun and different to do, grab one of these great collectible toys and have some fun. My sincere thanks to 21st Century Toys for this project sample!